Portugal Paws and Claws Rescue (PPC) was started as a not-for-profit dog rescue association by a group of Animal Lovers who began as volunteers with Louzanimales in Portugal, a local voluntary group that worked with the Lousa municipal dog shelter to find homes for dogs, either local strays or abandoned dogs. Some of these volunteers went on to form Portugal Paws and Claws Rescue and are now actively involved in dog rescue, finding forever homes for them in Portugal, UK and across Europe. We attempt to find foster homes for the dogs before they are eventually adopted, so they can be socialized and learn to live with a family. Our main aim is to ensure all dogs have the opportunity to live a “normal” life hopefully with a family of their own to care for them. We are expanding our search to find new homes for dogs in the UK (both foster and permanent) and are currently working with and looking for other like minded groups and individuals to help us achieve this goal. The greatest part of our work involves dog rescue, however we also aim to help cats and other animals. Many a long journey starts with a single step and the story of Patsy and Leila goes back a long way! About 3 years ago, Beiras Ramblers and Dog Walkers came into being as a group when I was talking to a friend. Many people we knew also had dogs and enjoyed walking, so the idea of adding a coffee and a chin-wag seemed too good an idea to pass up. A few walks down the line, over a post-walk coffee, talk turned to the abandoned and stray dogs in the area. To do something positive, we each agreed to put an extra euro in the kitty to raise some money for local animal charity groups. But before we knew it, we were finding our own strays to re-home, treat and sterilise. Of course, the more we did, the more we needed to fundraise. I had started running to mark my 54th year, so it seemed a good idea to use my new hobby. I went on to run the Lisbon half marathon and the Barcelona marathon, raising better than €400 between the two events. I should have realised, though, that however hard-won, the money is soon spent on worthy causes. Meanwhile, my activity in fundraising meant that I made contact with the local animal charity organisations. A familiar face, I was asked to join the committee of the Louzanimales Association. That Association works with the Lousã Council and the Municipal Vet and helps to care for and rehome the dogs that, one way or another, end up in the Lousã municipal shelter. So when Beiras Ramblers held a cream tea and coffee morning, and raised some €600, we pledged much of that to help the dogs in the shelter. As a member of Louzanimales I was very keen to get the Council to agree to daily access to the shelter for a volunteer team, who could spend time with the dogs; to get to know them and provide human contact. Maybe we could even get them out for regular walks! I thought this would be a good way to improve the lives of the dogs and also make them more adoptable. Up to this time, they had little human contact other than the employee who hosed out their kennels and refilled their water and food bowls. At the start, it was clear that we were not welcome, but a couple of us kept working away. At last, the Lousã Shelter Volunteers became a reality and every day, the dogs would get to have some attention and care from volunteers who also keep an eye on their needs, help with medication and vet visits and flag up symptoms of illness or distress. Today, there is also a group of volunteers walking the dogs on a regular basis. Always in need of funds to assist with the work, some friends in the UK offered to help us by starting up some fundraising there. Before long, we had set up a Facebook page and registered as a not-for-profit association in the UK. Portugal Paws and Claws had been formed. PPC could help Louzanimales by sourcing and helping to finance adoptions of dogs from the Lousã shelter, but they could also help other people who had rescued dogs and were unable to get them adopted; or those who took on abandoned or mistreated animals, but didn’t have the funds to pay for sterilisations, tests and vaccinations. I remember Patsy from my first ever visit to the shelter. She ran straight over to me in the compound and lay flat on her back, asking to be stroked. She was a lovely girl and always so happy to see us. I was desperate to find homes for all of the dogs. They didn’t deserve to be in the Shelter. They all had so much love to give! One day, whilst I was trawling the internet for ways of advertising them for adoption, I chanced across Dogwatch UK. 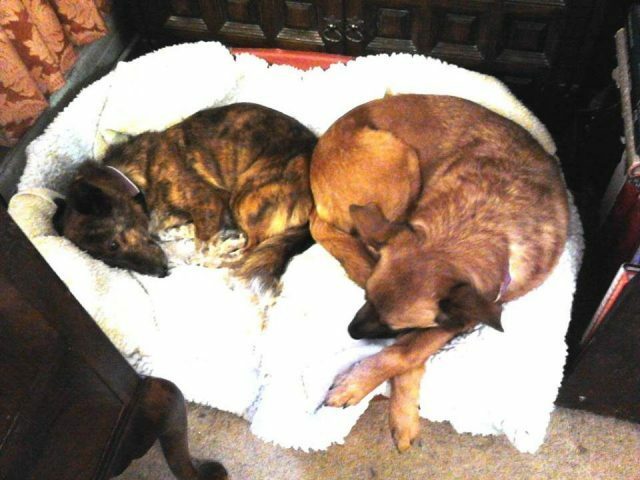 Looking at their page, they seemed to have links in Spain, so I e-mailed them and asked if they would be able to help and advertise some of our dogs. They agreed to give it a go and slowly but surely, we started to see dogs gaining interest and being rehomed. 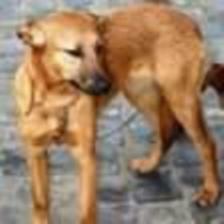 Patsy’s profile was one of the first I sent to Dogwatch. I was sure she would be snapped up straight away, as she was beautiful, gentle natured and adorable dog. Who could possibly not fall in love with her? But no one did. For 4 or 5 months she was on the site. Then one day I received a message. A woman called Eileen had been in touch looking for a Staffordshire Bull Terrier, but the dog she had asked after was already adopted. It seemed unlikely, but I sent Patsy’s details. Eileen was fairly clear that she wanted a Staffie, but asked if I could tell her about Patsy anyway? Finally, maybe someone wasn’t blind to Patsy’s charm. Eileen decided she had to have her and Patsy was going to a home of her own. Shortly afterwards, Eileen also saw our appeal on behalf of Leila, who had been living in a room in a house for 5 years. She was soon going to have to go the shelter. “Would Leila like to come and live with us too”? she asked. 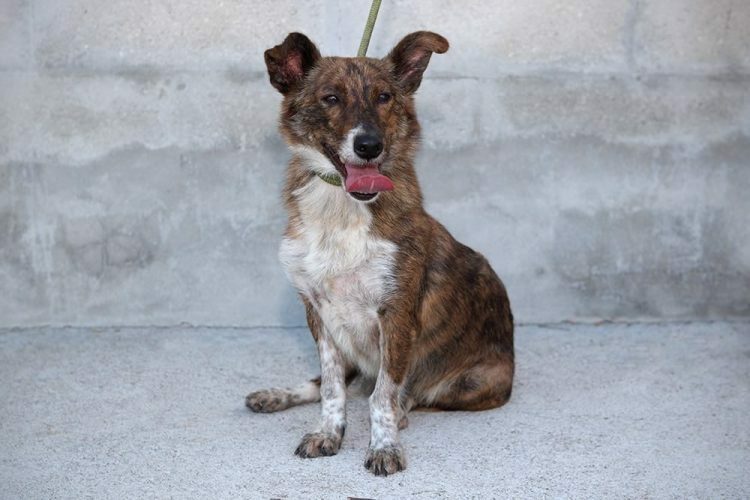 Patsy had been abandoned on the streets and taken to the municipal shelter in June 2017 Until volunteers were allowed to enter the shelter on a daily basis to care for and play with the dogs, Patsy received very little human contact. But despite this, she remained a loving and happy dog. She was always delighted to see people. Leila had been shut in a room in an empty house for 5 years, with very little contact with the outside world. Cared for by a person who could not re-home her, but went every day to feed her. Her carer did the best she could and in doing so, prevented her from being sent to the local pound or even worse. This way, two girls from the same town, who had never met, found themselves making their way to a Herefordshire village to start a new life together. Well, it’s been one week today since Patsy and Leila, the ‘dynamic duo’ as we like to call them, came to live with us. It seems hardly credible; the days have flown by in a blur of activity. The girls have taken the old house by storm, clattering up and down the stairs; in and out of the bedrooms; on and off the beds; and then out of doors to circuit the garden. It’s breathtaking! There are still things left to discover though. Some of these are the rooms in the old house that for one reason or another, are rarely used and lie, undisturbed behind closed doors. Occasionally I visit them to flick a duster around in a half-hearted way and this morning was one of those occasions. Suddenly, I was aware of a presence. Glancing in the direction of the door I saw two little faces, one on top of the other, peeping fearfully around the edge of the door. The dynamic duo was intrigued! Cautiously they advanced, examining everything thoroughly as they went. All was well until we got to the third room. They hesitated on the threshold and would come no further! The old house has its secrets, but the girls are aware and leave the room to its quiet memories. Perhaps they will not come again. How clever we humans think we are and yet, and yet, my sweet girls can catch a memory of another time which perhaps, still lingers here. I am left to close the door, to walk away and join them in the sunny garden.